Food labels and packaging plays a critical role in influencing consumer choice. Being the first thing the consumer sees while walking in the supermarket aisle, it needs to be eye catching to get their attention. 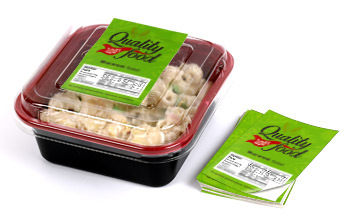 A good food label would create a lasting image that would represent your brand’s personality. It also needs to contain relevant information about the ingredients, nutrition facts and health value. Whether you are creating specialty salsa or homemade marinade, your distinctive design should go hand in hand with the best material to get the professional look. Here at NextDayFlyers, our customized labels can give you just that at a fair price. Our food labels can withstand varying levels of moisture and temperature so rest assured that your labels will last for a long time. Choose from a variety of sizes and types, cut-to-size and roll. Our food label’s self-adhesive backing can adhere to any smooth surface such as plastic pouches, glass jars and bottles. Food Labels is rated 3.7 out of 5 by 3. Rated 5 out of 5 by Holy Grill from Stickers high quality, fast and great costumer service! Thank you guys!